iShoppe: Daddy with a huge heart! Daddy with a huge heart! 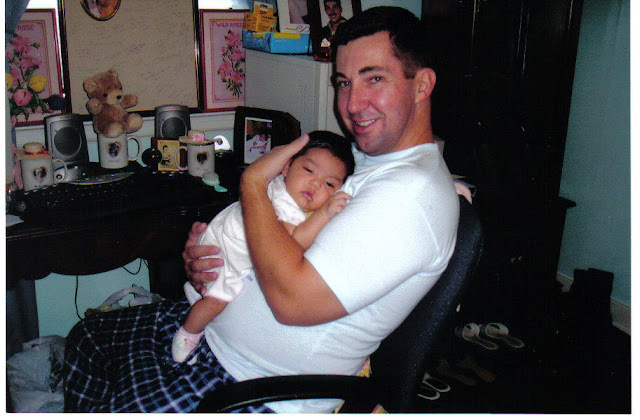 Since the theme for this month at Mommy Moment is all about Dads, I would be posting my entries here at hubby's blog. "I am a Daddy" is the topic this week and here's my share. Below is a picture of him with one week old Mr. Burrito. Sleeping on Daddy's big chest was one of the most special bonding of the Burritos with their Dad! The second photo was with Ms. Burrito when she was one month old. I am so proud of my husband, the proud Daddy of two very makukulit kids. He is everything that I ever asked for for a husband and for a Dad of my kids. We love you Mr. K! very nice post for daddy! and so precious photos! Oh, very touching moment..you're so lucky Rose to have a husband like John...anyway why Mr. K? k as in King? or Kottrill lolz. You are truly blessed to have a wonderful husband! your burritos are so cute!! visiting from MM. God bless you family, Rose! At gwapo pa! LOL Happy MM! Visiting from Mommy Moments. Thanks for sharing. Mr. and Ms. Burrito are so adorable. what a sweet and touching photo! oh! what a precious photos you have here. Priceless photos! You can really see how proud and happy your husband is to be a dad to adorable burritos. what a sweet dad! lovely shots too..